Here's a stick that's been on my "to-smoke" list for some time. After smoking it yesterday I regret waiting. Being a genuine "cheap ash," I waited until the Mayibme Robusto by A.J. Fernandez was on sale before picking one up at Cigar Train. Construction of the Mayibme was as good as I've ever seen. It was packed firmly full length and covered by a seamless, nearly vein free, oily, Colorado colored wrapper, which was topped off with a triple cap. From the foot there were mixed aromas of toast and cocoa, while the free cold draw had notes of oak and leather. Once the flame jumped to the cigar's foot there was a full bodied explosion of oak, cocoa and black pepper. These initial flavors were quickly followed by a complex mix of leather, brown sugar, brown paper bag, toast, sweet tea, charcoal, chocolate, espresso, and a fantastic burnt mocha finish. It seamed like there was a slight flavor shift with each puff. 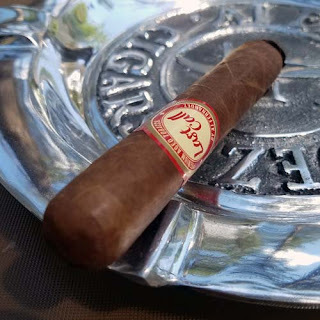 Top of the line construction and a complex flavor mix coupled with a ninety minute burn time make this cigar a real winner. If you haven't picked up a Mayibme, maybe it's time you should!